But still, what were we going to do with four freakin’ gallons of Grade-A gelato, 120 spoke cards (note to self: don’t print the date; you can re-gift them later), and enough Slow Race Silly Bandz to outfit the entire 2-4th grades of the John Stanford School? Luckily for us, we worried over nothing. Apparently family bike folks are made of sturdier stock than the typical air-conditioning-swaddled SUV-driving Seattleites. Well, as long as everyone is here, we should get this bike party started! So that’s what we did. We had a big, hot, family bike party. And I’m here to tell ya: the first annual Seattle Fiets of Parenthood family biking celebration RULED. Whew! And if that wasn’t enough, we had a winner take all (well, flower-filled beer growler) “urban” race, family style. So hot, we were cool. Oh, and the heat? Yep. It was hot out there on blacktop. But we had the gelato. And Frank showed up with a bakfiets full of ice cold drinks. And then there was the secret, keep-cool weapon: the official carfreedays water feature. Take one sun shade frame, add about 50′ of hose (free! Picked from curbside and stuffed into Xtracycle on the ride home from the Saturday venue reconnaissance) zip tie and weave into said frame, poke hose liberally with sharp implement, and add water pressure. 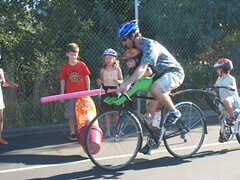 The culminating event at FoP: the family bike “race”, brought racers and spectators together lining the course and cheering for the 26 entrants. Families “raced” on many different family bike combinations, ranging from Xtracycles to trail-a-bikes, to parents riding alongside their kids on their own bikes, to tandems and tandem trailer combos, plus a few varieties we probably missed. The course featured the dropped toy obstacle, bike jousting, grocery loading, berry picking, a slalom section, and even a small jump. Yee-ha! Nothing like seeing a tandem-towed Burley trailer catch air while the passenger stands in back, Ben Hur style. And Special-K and Mad-E rounded out the podium with a time of 1:02:70. The infectious energy of Seattle’s family cycling community made for entertaining, inspiring spectacle. Lake-schmake. This was the place to be. The Portland Fiets of Parenthood crew. We traveled to their 1st annual event in June and got lots of great ideas. all of our friends who helped in many different ways – we couldn’t have done it with out you. Cascade Bicycle Club, Bike Works and especially the Seattle School district for allowing us to hold the event at John Stanford. And last but definitely not least, a huge thank you to our co-hosts and great friends Julian and Kim: co-conspirators in the proliferation of local family bike goodness. We had a fantastic time planning and hosting the event and we’re definitely looking forward to the second annual Seattle Fiets of Parenthood 2011 (location and details to come. Sheesh give us little while to recover). Want to torture yourself for missing the family cycling event of the year? Then by all mean check out our photos and the FoP Flickr group. And if you wanna show your neighbors what a good time you had, please add your shots to the collection. This entry was posted in bigger than here, bikes, family cycling, kids, seattle, summer, weather and tagged bikes, family, family bikes, fiets of parenthood, fop, xtracycle. Bookmark the permalink. We had a blast! Thanks so much for organizing. so glad you two made it! That looked like so much fun! I loved the slideshow. 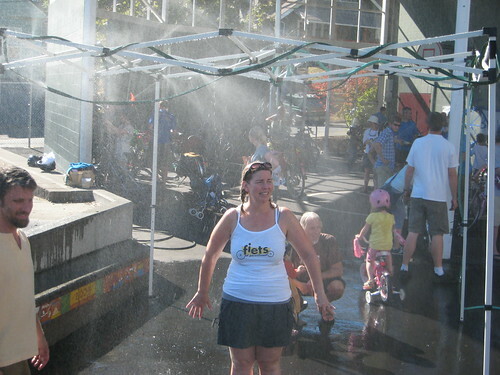 Tim, Ron & I could have used your clever misting station in Bellingham, on Saturday.It was HOT on the R.S.V.P. Good idea! we also had a 5-9 year old squirt gun team on the course….they would be useful on RSVP as well! I’m so happy that it went well! Good call on the misting station- way to think on your seat! Yeah, it was hot in every sense of the word. The gelato travelled in dry ice insulated comfort, but I just about expired pedaling it up the hill from the Burke. A fantastic turnout, on all sorts of family steeds, and an enthused group of kids tearing it up on their bikes. We had a blast! This event was awesome! It was great to finally meet Tom, Anne, Tim, Chris, and Julian, all folks I’ve read about on Totcycle and CarFreeDays. My kids had a wonderful time, too. 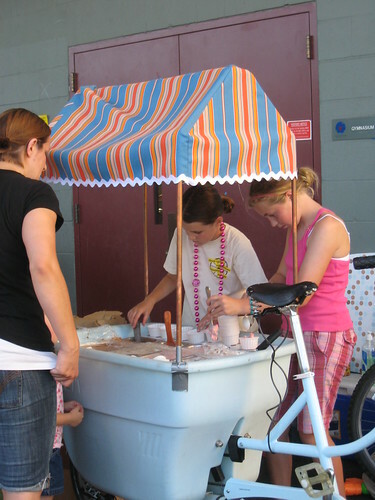 The gelato and misting station were huge hits with them. Now if only I could pull off something like this in Tacoma! I’ll post some pics and video on my site soon. Great to meet you as well. If you organize a Tacoma event we’d be there! Not sure if you do Flickr, but if so, add your pics to our FoP Flickr group. This was a really fun event, and the spirit was just right. Thanks to Tim, Anne, and everyone else who worked to make it happen. Thanks for coming, we’re glad you had fun. And thanks again for all the water! That was a necessary detail we didn’t remember. Your kids rocked the course, btw! The Schmidt family had a blast at the Fiets! This was out first family bicycling event. We’re looking forward to more. I’m so glad you had fun. We’re looking forward to more as well! Congratulations! I am so glad the event turned out well. You have long inspired us East Coasters so just maybe next summer…. a Fiets on this side of the country? but I am also working on a new long-tail family biking design…. Yes, do an East Coast event! We’ll look forward to following it virtually. Julian and Kim did the shirts…contact them about an exchange. What a great idea. I’d love a long-tail shirt. Let me know when it’s done and I’ll order some for my family! It will compliment my collection of Patagonia “Ditch the Car” shirts. Thanks for all the feedback everyone. Your energy made this a really fun event! 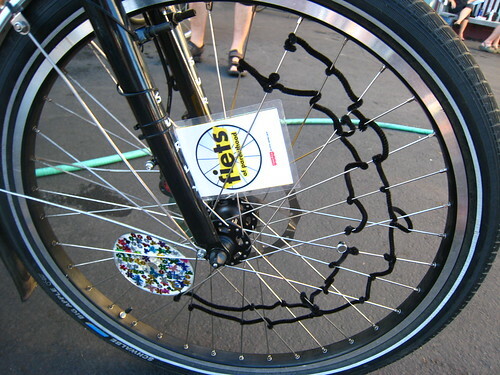 Anne– Will let you know when I come up with some sort of long tail bike design. Meanwhile I just tracked down Ditch the Car shirts online. Love ’em!